Hi there and welcome to my new blog! This blog is all about computers, nostalgia, gaming and gamedev and other nerdy stuff I happen to like. I will write overviews about some older and/or different tech I have, cover some games I used to play when I was younger that aren't very mainstream, opinions and my own experiences about computer and tech related things, et cetera. The name of the blog comes from combining words bit and akselmo, if you didn't guess that already. The banner of this blog was made by my fiancee tecsiederp. I have tried blogging a few times before this, but I eventually ran out of things to talk about. I kept the scope way too small, but now I will cover wider array of topics so I have always something to write about. Also, if I'll ever get a proper video camera I will start making videos about the topics I cover as well. I try to post a new thing at least once a week. I'm going to keep this first post a bit self-centered and talk about... Me! Well, I'm nobody big or important and I doubt I'll ever be, and that's fine by me! My (nick)name is Akselmo and I'm from Finland. I've played around with computers since I was two years old, so the interest into computers and technology started long time ago. I often tore up broken (and sometimes working) devices, such as radios and computers, to see what they looked like inside and what made them work. I knew my way around MS Office software already when I was 5 or 6 years old, thanks to my grandparents. They had a PC with Win 98 and all the Office software which I liked to play around with, pretending I was an important businessman. I played cool games like Mad Dog 2, Tomb Raider 1, Network Q Rac Rally Championship and Pro Pilkki on that PC. I have that PC in my storage now but I'm not sure if it works anymore, I haven't had the time to try it out. 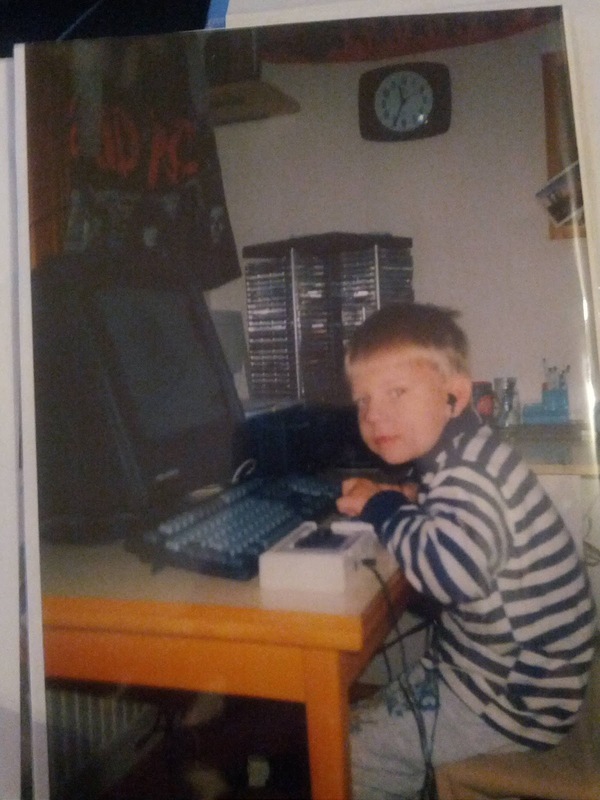 I think I was 4 years old in this picture, playing at my grandparents PC which was in my moms old room. I also got a NES as a birthday present when I was about three years old and I still have it and few games for it. I try to keep good care of all the devices I have. So yes, I definitely have experience around technology, but there's always so much more to learn. That's one thing I really like about technology and computers: They keep getting better and changing over time, so there's always something new to learn! I have many video games I love, such as The Elder Scrolls -series (especially Morrowind! ), Quake and Arena FPS games in general, Mass Effect -series, Dirty Bomb, Battlefield -series... So mostly FPS and RPG games. I like multiplayer games more than singleplayer, but nothing beats a well written singleplayer RPG. When it comes to computers, I love them, old or new. I like watching Youtube videos of old PC's that were made before I was even born, or checking out the newest components for modern PC's. I hope to build my own nostalgia-PC one day, with parts made around the years 2000-2006, just gotta find those parts. I also find the smaller single-board PC's very interesting, so I have bought myself a Raspberry Pi 2 and PocketCHIP, which I will cover here someday, too.